Overcoming With God: Debra E. Marvin -- Heroine Susannah Kimbell & Giveaway! Miss Susannah Kimball’s story, "A Heart So Tender", in The Backcountry Brides collection is story set in July, 1764 at Fort Niagara. This great historical landmark lies at the mouth of the Niagara River where it flows into Lake Ontario. While Susannah lives a rather unusual frontier life as the daughter of the music and literature teacher at Sir William Johnson’s Mohawk School, she is not prepared for the cultural tensions rising at what Sir William, Indian Agent for the Crown, is calling “The Great Gathering”. Susannah lives in the settlement of Johnstown (NY). There, Sir William has built a community of white settlers and Mohawk families. And he’s succeeding. Johnson is unusually accepting of people of all colors and faiths and has great hopes for peace along the frontier. Susannah has the same hope. It is her dream to open her own school for girls, primarily native girls, but it’s not entirely unselfish. Her adopted brother Benjamin, an Iroquois orphan, straddles two worlds. Teaching would give him a place of respect that he might not otherwise find in the white world, nor among the Haudenosaunee. To celebrate and promote what Susannah believes in, she sings duets with her brother. The Mohawk call her Yonterennothiyo, (She who sings beautifully) or “Songbird”, and in my story, Sir William uses this gift to his advantage as well. But Susannah has another reason to desire a life of service as a single teacher, a secret she can’t share and one that requires she never fall in love. 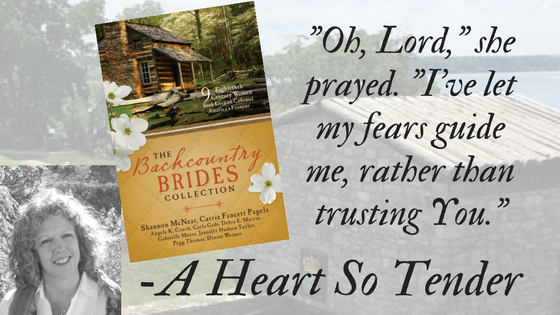 I hope you find yourself reading The Backcountry Brides Collection and enjoy my novella, A Heart So Tender for more of Susannah’s story! Check at your local Christian bookstores, e.g., Lifeway, to see if they have copies, too! GIVEAWAY: Tell Deb what Native American history is found in your area for a chance to win a paperback copy! We have several Indian Reservations around our area, Cherokee, Winnebago, Little Sioux, Omaha and Santee are some. Hi Wendy, thanks for commenting! It would be a very interesting place for me to visit. What a deep history brought by these tribes. Hi Deb! I'm in MN, and we have a large Anishinaabe (Chippewa, Ojibwe) population here, in the northern half of the state. In the south, we have Dakota tribes. Minnesota is actually a Dakota word meaning “Whitish or Sky-tinted water." My father comes from the Texas Louisiana border, and my grandmother was half Apache, though I know very little of my Apache heritage. Thanks Patrice! That history spans the depth of what is now US of A. Not a pleasant history to look back on but fascinating nonetheless. I've spent quite a few vacations in Arizona and that increased my interest as well. I loved your story Deb. I loved the whole book! Thanks for all of your support and encouragement, Andrea! Would love to read, the book sounds like a great read. 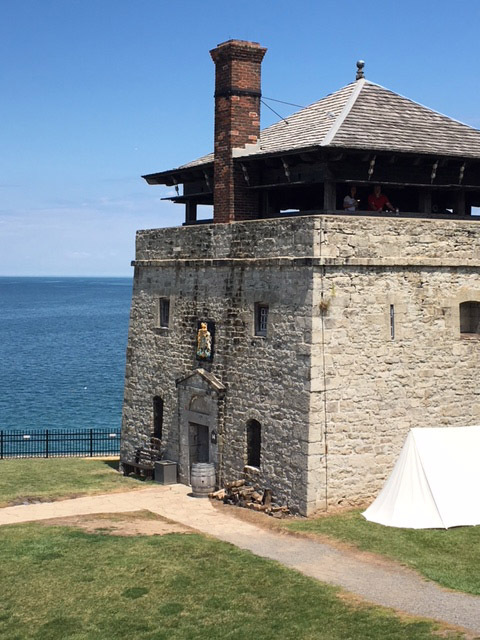 I just visited Old Fort Niagara last year and it was so interesting. Also a really beautiful setting. I'm originally from Michigan and there were Ottawa Indians in our area. Thanks Dianne! I visited last year during the French and Indian War Reenactment which was a lot of fun! It's a beautiful place and the French Castle is an incredible building, isn't it? I wonder how Ottawa, Canada got its name as I'm wondering if that tribe was spread out that far. Ontario is a huge province, of course! We live in Lenapi territory and our fourth graders spend a good portion of the year learning about the Lenapis in social studies. Hi Mindy! I have to admit that I don't think I've heard of the Lenapi despite all my efforts over the years. I recall how much my local history came alive in fourth grade and a visit from a Seneca woman who came from the reservation near Jamestown, NY to talk to us about her history. It obviously made an impression on me! Thanks for commenting. I lived in rural NC. My late husband found lots of arrowheads in our area. He had quite a collection. My history in this country feels pretty shallow when I think about who lived where I live now. Thanks for sharing, and for commenting. Best wishes for the giveaway! I am in QLD, Australia. I live in a country town called Toowoomba which means "Swampy Place" in a local Aboriginal dialect. This area is the traditional land of the Gaibul & Jarrowair peoples. Such musical words! Thanks for sharing that. It's a sad history in our countries that may be slowly being resolved. As for Toowoomba, I'm wondering just how swampy it is year-round. Will have to look it up to find out more. We've got Lenape heritage around my area! I live in Cayuga land and Cayuga means People of the Mud because there's a swamp at the north end of the lake! I loved the Barbour Romance collections! I'm not sure what, if any Native American history can be found where I live. Thanks Caryl! The collections are wonderful books and so beautiful 'in person'! Thanks for all of your support of my stories! We have a number of local tribal reservations in and around where we live. More pointedly, we have members in our family that are a significant percentage of Chehalis (Washington State) and some who still live on reservation land. Thanks Terrill. I'll be learning more about the area very soon, as I'm going to the Washington coast very soon. I've always been fascinated with Lewis and Clark and so there's a lot tied in to their dependance in native people to help them during their long journey. I hope to visit Fort Clatsop. Do you feel that the native people of Washington had an easier time of it as far as not being chased from their lands as were so many from the east and south? In my region I think the most well known would be the Comanches, and related to that would be the abduction of Cynthia Ann Parker from Fort Parker area. She became the mother to Quanah Parker, well known chief of the Comanche. dobeworld at sbcglobal dot net. Hi Cathy, thanks for commenting. I've certainly heard much of this story and have probably read a few accounts of that history. There is such a deep history of the native peoples of this continent and many of us don't go any farther than what little we learned in school. I guess that's the same for any part of our history. Thankfully there are those who love research and history. Hi Carrie & Debra. I enjoyed this post and all of the stories in Backcountry Brides. Historical Fiction is one of the genres that I love. Debra, I'm also looking forward to your next Girl Detective! I already have this book so I'm not entering my name for this drawing. Thanks for mentioning the girl detective! That will now be a fall release! You're sweet to mention it. Great post Carrie & Debra! Debra, I enjoyed your novella in this wonderful collection. Thanks Tina! 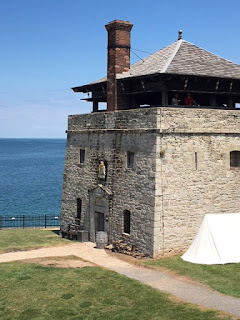 I loved being 'in this story' as I was writing it, and then visiting Fort Niagara again afterwards! Years after my story, and because of the death of Sir William Johnson, the newly independent country's army under George Washington decided that the Seneca nation couldn't be trusted and General Sullivan's troops swept through western NY and burned all the tribal villages before winter. It's another ugly part of our history. Even the tribes that had fought alongside the colonials were chased out of 'the country' and mistrusted. Thanks for mentioning the Sand Creek Massacre Vivian. Thanks Rory! I appreciate your comment and your encouragement all of these years! Congrats, Rory! Per random.org you have won a copy of The Backcountry Brides Collection! It's RELEASE DAY!!! Party Time!! !